For 20 years Walewska and Placido Pires of Joao Pessoa, Brazil, have believed God's promise for a baby from their own bodies. This belief has added to their joy in adopting two daughters during their wait. Now, in 2007, the Pireses have learned they will soon be blessed with the birth of their third child. Walewska said, "My two daughters are from my heart, adopted, and Placido and I have held to the promise from God that He will give us a baby from my body. We have waited on this promise for 20 years." At the Brazilian conference this past spring, Dave Duell prayed for and prophesied over Walewska, telling her "in 13 months I will have a baby in my arms." Hallelujah! "Another person in the conference (I don't know his name) prayed for me and Placido, and God spoke through him that His promise is close and I needed to prepare myself. After this Dennis called all the women who believed God that they will become pregnant to come [forward] because he would like to pray over them. I was the first to stand. It was a little difficult - after 20 years of waiting - but I know that I believe, and I went forward through faith. And I know now that GOD liked my faith!" Walewska and Placido ask that we share their joy and their miracle with everyone! This is such an exciting story! 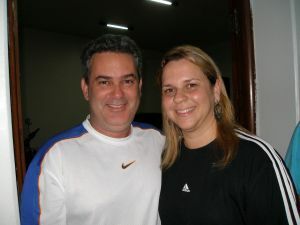 We met the Pires in Brazil and got to pray for them to have a baby--and now it is happening after 20 years of marriage!